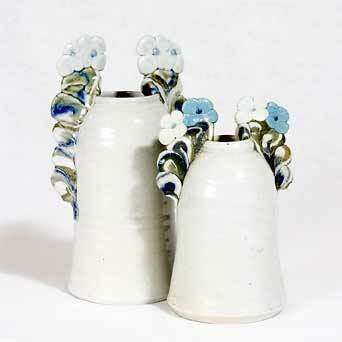 Pair of Jane Hamlyn pots - 4" (101 mm) high. Jane Hamlyn originally trained to be a nurse, but became interested in potting in 1968. She she attended adult education classes and then in 1972 took a course at Harrow School of Art. In 1975 she set up Millfield Pottery near Doncaster. Since then she has worked full-time as a potter and established a fine reputation. Jane specializes in salt glazed stoneware. Her work is thrown and hand-built, often highly decorated, and has been exhibited widely.